So recently here in Scotland, working as a photographer for clients on a variety of assignments and stories I’ve encountered a lot of flags, and a lot of discussion on whether we’re Scottish, British, or both. Photographic assignment jobs are coming in now asking me to go out and photograph both sides of the independence referendum debate, the Yes Scotland side, the nationalists, and the flip side of the debate, the Unionists and the Better Together campaign. I thought I’d present a couple of images from this set so far. 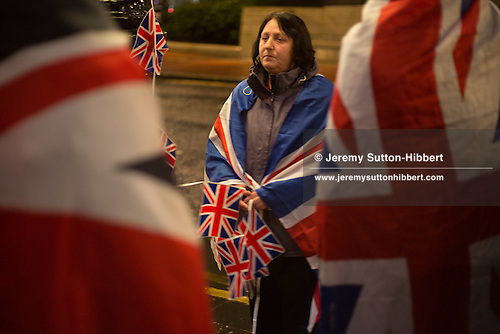 The above image was taken in George Square, Glasgow, a couple of weeks back, at a demonstration showing support for the protests in Northern Ireland at the decision to only fly the Union Jack flag above Belfast City Hall on limited occasions. The demonstration that night, in Glasgow, was of about 100-150 people, a few police, and quite calm. A few renditions of Rule Britannia and other Unionist songs, and the glow of the orange sodium street lights gave the images some atmosphere. Not quite a demonstration concerning the upcoming independence debate, but it does have relevance. The protesters unfurled a banner that read “Don’t Break Our Unity”. Having been photographing Rangers Football Club in the 3rd Division this year, I’m quickly amassing a large collection of Union Jack flag images. Almost beginning to dream in red, white and blue. The below images comes from an assignment last week, to photograph to illustrate an article on next year’s referendum on Scottish independence. The original brief was to drive up to Bannockburn and Stirling to photograph, but after chatting with the picture editor we decided to compliment that idea with images of some street campaigning in Glasgow. Thankfully that day there was a lot of campaigning going on, from boths political camps. 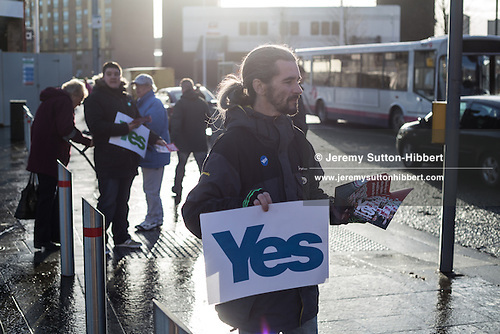 The below picture comes from the Yes Scotland, pro-independence campaign, out on the streets of Govan, Glasgow. A small campaign team, with no banners, no table, not much for me to shoot, but thankfully the winter sunlight helped give it a certain ambience. 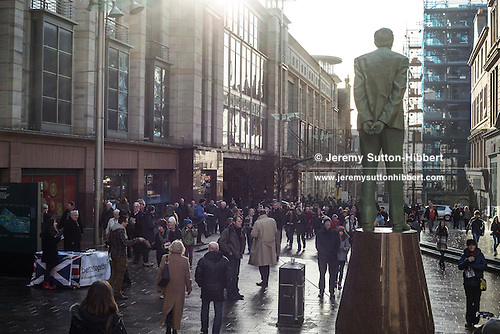 After photographing the Yes Scotland campaign in Govan, I headed quickly into the city centre, to Buchanan Street, to photograph the Better Together campaigners at work, out handing out leaflets. Talking with the commissioning picture editor we’d chatted about trying to keep the images wide, showing some sense of the city, not just focus on the campaigners or the leafleting. Thankfully, knowing the city, I knew there was a good chance that the statue of Donald Dewar, the 1st First Minister of Scotland, might appear in the shot, and thankfully, Donald, up on his pedestal, obliged, setting the scene in the image for Scottish politics and the parliament nicely. I’ve no doubt that over the next year or so, as we head towards the referendum on Scottish independence, that I’d better get used to seeing and photographing flags, Union Jacks or Saltires, and better get used to photographing the campaigning out on the streets of Glasgow, or Edinburgh, or further afield in the country. It’s going to be interesting, an excuse for me to travel the country, listen to the arguments, to photograph Scotland. Yes – it will be interesting times over the next few years, for Scotland, UK and our position in the EU.